The Pakistan Tehreek-i-Insaf (PTI) and Janoobi Punjab Suba Mahaz (JPSM) have reached an agreement that will see the latter merge with the former, DawnNewsTV reported on Tuesday citing PTI spokesperson Fawad Chaudhry. "The negotiations between PTI and JPSM have concluded," Chaudhry said, adding that an official confirmation of the agreement is scheduled to be made in a joint press conference tomorrow. The JPSM group, which comprises more than 15 former elected representatives of the PML-N, is expected to make its merger official after meeting PTI Chairman Imran Khan on Wednesday. "The rest of the details will be disclosed tomorrow in Islamabad," Chaudhry added. The JPSM is a movement of like-minded politicians, mostly from the ruling PML-N, who demand the creation of a new province in south Punjab. 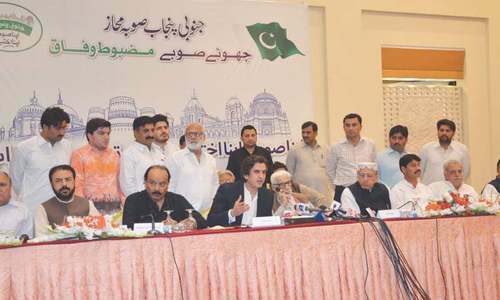 Early last month, Khusro Bakhtiar, a former PML-N leader from south Punjab, had held a press conference flanked by like-minded lawmakers to demand a new province "for the security of the future of the children of south Punjab". During his press conference, Bakhtiar had explained: "New provincial demarcations are the need of the time. We are not here to start a rift — time has made the need for new provinces very apparent." "The demarcation of new provinces will ensure that funds allocated for Rajanpur are not given to Multan," he continued. "All we want is equality amongst the regions." 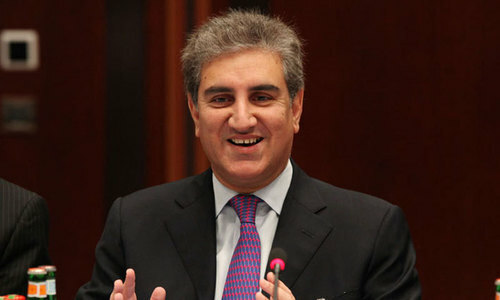 "We have a single point agenda: the creation of a new province in south Punjab," Bakhtiar had said. Speaking of the movement's future alliances, Bakhtiar had said, "We are ready for dialogue with any party." "Our goal is simple: when the new assemblies take oath, the legislation for a new province should be passed within the first session. If that does not happen, we will go to the Supreme Court," he had stated to cries of assent. Later, the PTI had backed the JPSM's demand for a separate province, "not for linguistic reasons but on administrative grounds to mitigate the miseries and sense of deprivation being faced by some 35 million people living in Bahawalpur, Multan and Dera Ghazi Khan divisions”. PTI playing hard-ball now. I think they've finally learnt this funny old game of politics. The end of this month will truly determine the winner of the elections, so far my bet is headed for PTI. 15 more turncoats in PTI,way to go!!! If created, practically it would be a Sindh Province Number II in performance and qualities. They have no mandate of doing any fabulous job that is waiting to see the light, like the gigantic South Punjab Dam planned and primarily designed since 1967 and rotting in archives. Well done PTI. It's very good for better future of Pakistan. @M. Saeed It is not question of "... gigantic South Punjab Dam." Its question of distribution of funds, access to the government services and basic life facilities. Sharifs work hard to make Lahore a Paris, did they ever make any claim for Rajanpur, Layyah, Bahawalnagar or Muzaffar Garh? Please just travel only once in your life time to see any of these districts and then tell me how much Punjab has developed in 70 years of freedom. Our provincial governments tend to build all governments service offices, learning, education & entertainment centers in capital cities, in our case Lahore, that is not gonna change but after having a south punjab province people of Rajanpur will have to travel 200KM to access provincial level facilities as opposed to 700KM now. Nobody is angry on making Lahore a Paris but at the same time we want to see Bahawalpur, Multan, DGKhna at least worth living cities. New province in Punjab is the need of hour. Population of Punjab has increased in the last 2 decades and is increasing day by day. So better to divide Punjab into two provinces before any untoward situation among the people of Punjab. @Waseem Can’t agree more. More and smaller provinces is key to better governance, distribution and appropriate use of developmental funds. We need more provinces, not just South Punjab province. With 220 Million population and growing, need of more administrative units is the right and urgent direction. While this is demand for a regional administrative control as a province, real need is strong '!local government's at micro local levels. Until that takes root effectively, the spectre of deprivation will keep raising its ugly head due to misappropriation and misdirection of public funds. Creation of roughly equally sized provinces will lead to better governance,. The issue should not be treated as linguistic and ethnic. The people want a new deal, and the politicians want a new deal. PMLN lawmakers again in Punjub but this time through PTI. What is naya here? Just for an idea of a governable unit, USA has 50 states for 300 million population (avg 6 million per state), whereas Pakistan has 4 provinces for 220 million (avg 55 million per province). Pakistan should have at least 10 provinces to have effective governance. Who next will join PTI? Musharraf? The way Imran Khan is taking every one in, why not invite Nawaz Sharif as well? Pakistan should have at least 12-14 provinces from an administrative point of view but means more staff and salaries! Break away Punjab it's a must! South and North Sindh another important mission for PTI, merge FATA into KPK, declare Gilgit and Baltistan and Hazara a province. Just look at India, Turkey all created new states, why can't we do it, it's a need of the day as Nawaz Mafia and Zardari Mafia needs to realized this drama of you scratch my back I'll do you yours is done with. Their times is coming up no more continue mega loot not even leaving hospitals alone, suffering of unimaginable scale is happening due to them. The People of southern Punjab will now be ruled by these "Jagirdars"? I think the prospect is even worse than before. Incharge of Political Manipulation - PTI Desk wants PTI get more seats but not more than 70. Even then PTI is headed for big failure. New provinces will only bebetter if we improve governance and get sincere leaders who fan work day and night instead of just doing the mudslinging. A south punjab will be roughly of the size of sindh, so have we improved the sindh in last 70 years ! Its just electioneering and buying and selling going on so just take it like that. Creation of a new province will rapidly increase the development process in Pakistan , southern province will have its own capital , provinciable assembly , and development of its own industrial base, establishment of its new universities and educational institutions , this is the need of the hour , likewise other provinces will need to be split, to create room for growth . We knew it from the day one. You cannot claim to achieve higher goals with a rotten lot. Its not possible, simply. @Waseem Agree with you word by word.